At Syracuse University, our Office of Human Resources is dedicated to the success of our faculty, staff and student employees. Our priorities are clearly defined and focused on helping employees achieve their career goals and worklife balance. Working at Syracuse means that you have comprehensive and generous benefits, great colleagues from all 50 states and around the world, and are a part of a great University community with more than 21,000 students. From training and professional development, to wellness and financial planning, our team is ready to provide the support and professional expertise for employees in the modern workplace. Identifying professional development opportunities for University employees. Benefits: Sarah Azria, Director of Benefits Strategy: Provide strategic advice on the development and maintenance of a competitive benefits program, and manage relationships with all benefits vendors. Compensation: Pamela Socker, Director of Compensation Strategy: Provide strategic advice to University leaders to ensure equitable and competitive pay throughout the University as well as consistent titling and classifications. Talent Management: Provide full range of global talent recruiting and hiring needs for all University staff and support staff development and performance evaluation programs. HR Information Technology: JoAnne Wallingford, Director of HR Information Technology: Manage and maximize HR technology, and lead and support process improvements. Wellness + WorkLife: Gail Grozalis, Executive Director of Wellness + Worklife: Manage a range of University wellness and worklife initiatives and supervise and align the Faculty and Staff Assistance Program with University global workforce needs. Shared Services is a model that organizes operational and transactional HR functions to deliver consistent, reliable and customer-centric HR services. The HR Shared Services Center leverages the foundation of the current HR Service Center to provide additional services that allow the schools, colleges and administrative units to focus on their goals rather than transactional HR functions. Our Senior Human Resource Business Partners serve as experts who provide frontline strategic advice on a variety of HR matters to a dedicated set of schools, colleges or administrative units. The Senior HR Business Partners partner with leaders in schools, colleges and administrative units identifying staff development opportunities, offering strategic advice and assisting with HR matters in their areas. 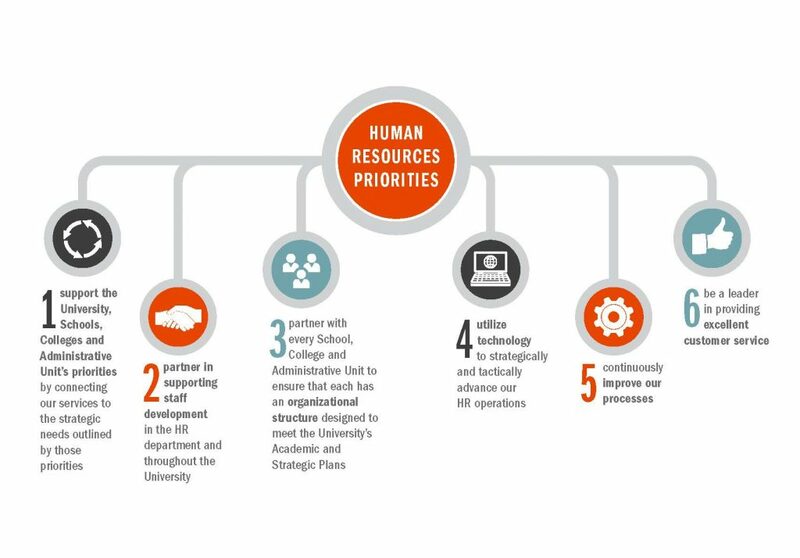 One of the benefits of having a dedicated HR partner includes providing faculty and staff more time to focus on the needs of students and less time devoted to HR matters. Senior Vice President and Chief Human Resources Officer Andrew Gordon provides support to the Office of Human Resources. Our Labor Relations team promotes positive labor-management relations using an interest-based approach to achieve positive outcomes and support of the University’s overall mission and strategic plan.